Somebody just said shared an amazing fact – it is only 7 weeks till the Christmas holiday. I’m not quite sure how I feel about that, but today I enjoyed helping the downtown Anthropologie create their holiday display. 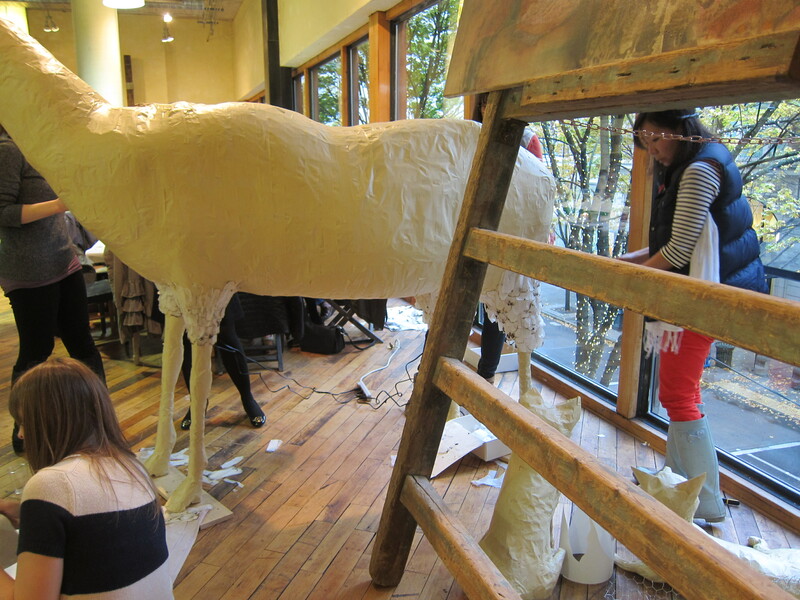 A burnt thumb later (that hot glue gun was, well, extremely hot), we went home leaving the elk legs well filled in. 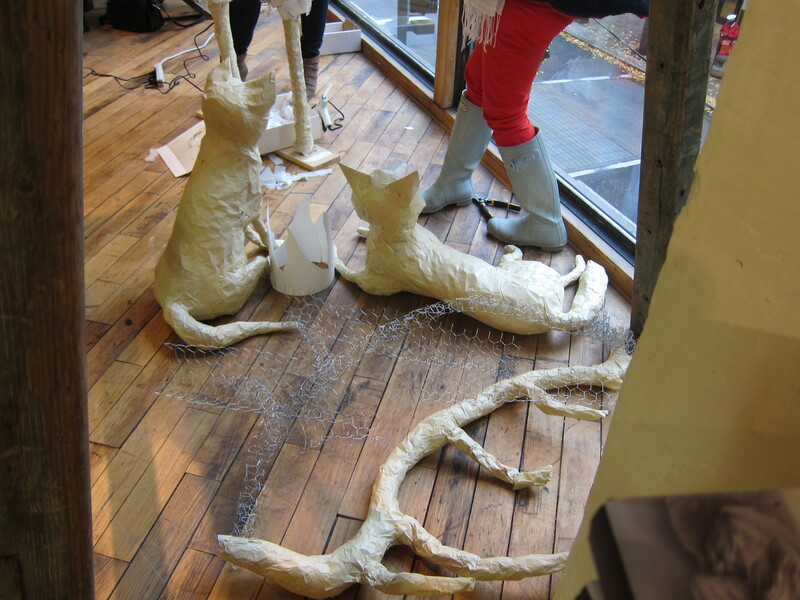 The creative displays are this store’s version of the company theme this year, paper craft. 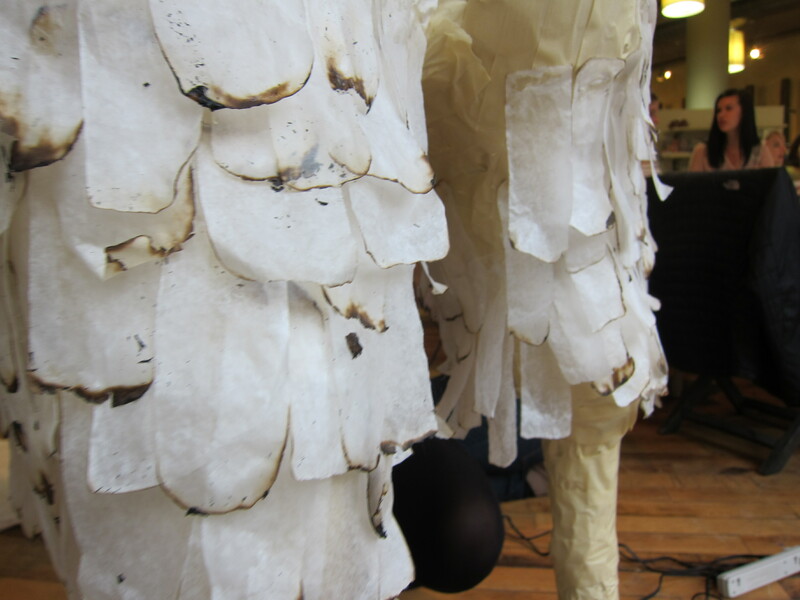 Basically they made shapes with wire, stuffing and paper tape, then cut strips of wax paper. Burn the wax paper edges slightly and dunk into a tray of water (it burns really fast), then glue these onto the animals. I can’t wait to see the elk when I get a chance to drop in again, I’ve unofficially named him Albert and wish I could adopt one of his fox friends. 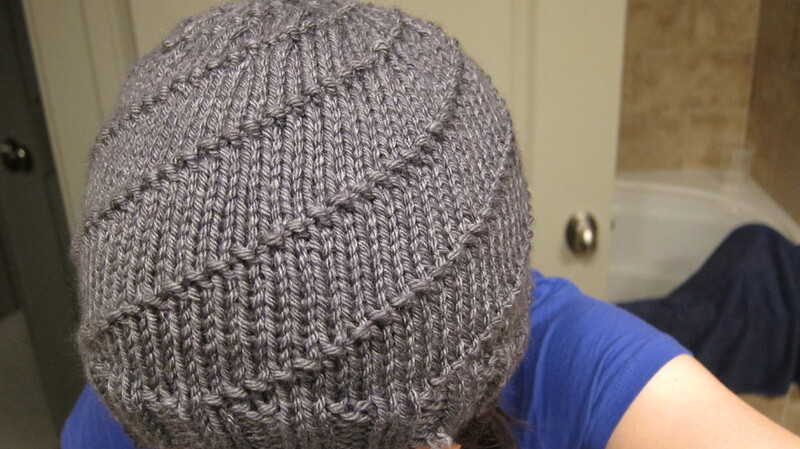 My sister requested a hurricane hat, which I have to say looks very cool. I didn’t make up the pattern, although somehow it came out too big and I ended up decreasing more aggressively than the pattern. I made this out of 1 and 1/2 balls of Cash Vero, which is incredibly soft. Awhile back I tried out swap-bot, which is an awesome idea but turned out to be somewhat hit-and-miss. Some people’s idea of interesting crafty stuff was clearly not the same as mine. Other things were quite lovely, but it was really hard to tell what you were going to get. As an example, I sent very fancy tea from France and got Bigelow. There’s nothing wrong with Bigelow, it just wasn’t an equitable swap. The most fun swaps (and I think you should do these with friends you know) were the tea + surprise and the yarn ball. The yarn ball is similar to those surprise balls that you unroll as a kid and plastic stuff falls out. I got a swap partner who had been flaked on several times, so I set out to make her a special ball. BTW these make wonderful gifts for kids. They loooove to unwind the ball and collect the goodies. I chose sparkly mini gem stones, buttons, tea in muslin sachets from France, a butterfly notebook, a gold butterfly clip, two perfume samples, a purple glitter pen, two soap samples, a Hello Kitty charm, a tube of multi-color glitter, bamboo knitting needles, purple tea cup fat quarter and of course, lovely purple yarn in wool and cashmere. First you get all the goodies together. It’s best if your center object is small, roundish and makes noise – I took an old empty mint tin and filled it with the buttons. 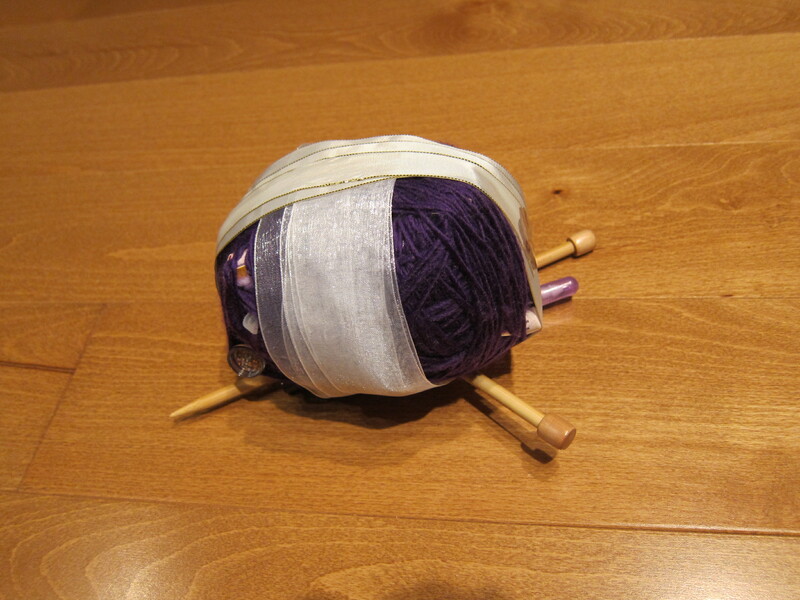 Wrap the center with yarn or ribbon (you basically unwind the ball). Put the bigger and more unwieldly items next, like the notebook. Try to balance out, put a large item on each side. Don’t despair if it isn’t round yet, most balls eventually get pretty close. 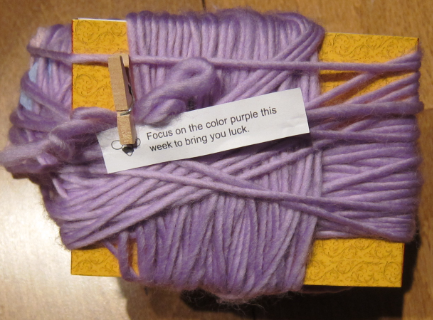 By a stroke of luck I had a “purple” fortune cookie message, which I attached after I had hidden goodies in the first ball of yarn. Try to hide each item and then add the next, but if you have lots of small items, you can just wind a strand of ribbon/yarn over the item then add another. If you have pens or similar long items, you can skewer the ball afterwards instead of trying to hide them inside.